Is there anything you can do to to prevent it? Scientists and doctors who study dementia and Alzheimer’s are battling with these same questions daily. While they have learned a great deal about how dementia affects the brain and have developed ways to test for it, such as MRI scans and spinal taps which check for markers of certain proteins, the only definitive diagnoses is through autopsy. To understand what researchers have discovered in the brains of those affected, we first need to look at the memory system of the brain. Only then can we see the connection of what is happening in the brain and what we observe in those affected with dementia. Scientists have identified four memory systems that process information for storage and retrieval: Episodic, Semantic, Procedural, and Working Memory. Though memory may involve more than one part of the brain for action or retrieval, there is one section of the brain that is primarily responsible for each system. Episodic memory is directed by the hippocampus and is in charge of remembering new information and recent events. This is usually the first part of the brain affected and the problem we first take note of in the dementia patient. Thankfully, memories of past events are not affected which is why patients often talk as if they are younger or have conversed with a deceased relative. Semantic memory takes place in the cortex and is the one we worry about when we have a “senior moment.” It involves storage and retrieval of facts such as the Months in a year, naming and describing a common object, and categorizing objects. Procedural Memory is located in the cerebellum and enables us to learn activities and skills that will allow us to perform them automatically, such as driving or playing an instrument. Not only can there be loss of previously learned tasks, but those afflicted have difficulty learning new skills. Working memory, commandeered by the prefrontal cortex, governs the ability to concentrate and pay attention and enables us to temporarily keep needed information in mind like directions to a restaurant. When this part of the brain is affected it is hard to concentrate and learn a multistep task. 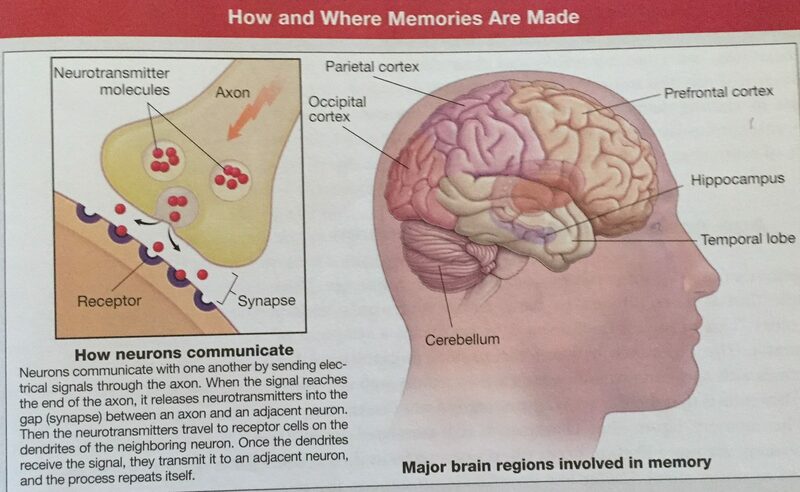 All memories are made when neurons in the brain communicate with one another by sending electrical signals via axons which release neurotransmitters. This path from neuron to neuron imbeds a memory. The gap between the neurons is called a synapse. The brain contains about 100 billion neurons. Few neurons die over a person’s lifetime, but they do shrink. Others are disabled by damaging molecules called free radicals. This is probably why mental functioning slows in middle and older age. Over time, these changes can make it more difficult for an older person to learn new tasks or retrieve information from memory, such as someone’s name. These changes, though, are not disabling as occurs with dementia. Events that are associated with emotion are more easily recalled. What you were doing on Nov 22, 1964? Sept 11, 2001? This memory-emotion association may also explain why sometimes thoughts about a negative event in our life stay with us longer; people can’t let go when they feel they have been wronged. Most of my information was taken from Memory by Peter V. Rabins, M.D., M.P.H. Scientific American: Consumer Health, 2017 edition. This entry was posted in Dementia and tagged Aging, Aging parents, alzheimer's, caregiving, Dementia, eldercare, Memory loss, mental-health on February 17, 2018 by kathybjork. Since my main focus of this blog will be on dementia we first need a clear definition of what it means. According to the New World Dictionary the psychiatric definition is “the loss or impairment of mental powers due to organic causes.” People with dementia have significantly impaired intellectual functioning that interferes with normal activities and relationships. When I told people my mother was suffering from Dementia, they often said, “Oh Alzheimer’s.”, however, the two words are not synonymous. Dementia is a term used for a collection of symptoms which are caused by injury or disease to the brain. Alzheimer’s is a disease. While it is true that the great majority of those with the symptoms of dementia may develop Alzheimers disease, it is only one kind. Other diseases that exhibit its symptoms are vascular dementia, Lewy body dementia, frontotemporal dementia, Hunington’s disease, and Creutzfelt-Jacob disease. Dementia symptoms also can occur in those whose brain has been affected by injury or drugs. In the beginning my mother had what is called Mild Cognitive Impairment (MCI) which is early dementia. She had trouble with tasks that required reasoning, and could not remember what was said in conversations. She was able to live independently at first, but gradually her symptoms worsened. It is at this juncture that conflicts occur. Though the family realizes their loved one needs help, the person with dementia is usually not ready to give up his/her independence. And so, the caregiver challenge begins! According to the US National Institutes of Health:National Institute of Neurological Disorders and Stroke Although it is commom in very elderly individuals, dementia is not a normal part of the aging process. This entry was posted in Dementia, Family and tagged Aging, Aging parents, alzheimer's, assisted living, caregiving, Caretaking, Dementia, elder abuse, eldercare, hallucinations, Memory loss, mental-health, Parenting an Aging Parent, parenting the parent on December 29, 2017 by kathybjork.